One tidbit we missed during our first read of today's announcement of the 2009 Porsche 911: Not to be outdone by the likes of the Nissan Altima and Toyota Corolla, Porsche has decided to bite the bullet and include XM Radio and NavTraffic (with complimentary three-month subscription, no less). The 2009 911 will be the second vehicle from Porsche to include XM Radio; the Cayenne minivan SUV has been offering the satellite radio service for the past few years. Follow the jump for the full release. WASHINGTON, D.C. - June 9, 2008 - XM (NASDAQ: XMSR), the nation's leading provider of satellite radio, today announced that XM radio and its award-winning XM NavTraffic service will be available as a factory-installed feature on all 2009 Porsche 911 models. This will be the first time that XM is available in a Porsche sports car. 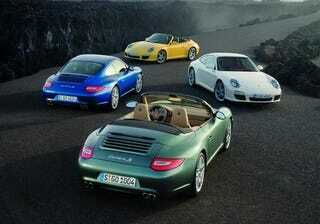 XM is the exclusive satellite radio provider to Porsche. XM radio has been available as a factory-installed feature for Cayenne models since 2005, and will now expand availability on all 2009 Porsche 911 models offering drivers more than 170 channels of music, sports, news, talk and entertainment coast-to-coast. In addition to XM radio, the 911 will offer XM NavTraffic. Powered by NAVTEQ, XM NavTraffic is the nation's leading real-time traffic service, featuring comprehensive information and coast-to-coast updates every minute. With availability in 80 major North American markets, XM NavTraffic ensures that drivers have the most current and most detailed traffic and incident information at their fingertips, whether they're commuting or traveling. "We are proud to partner with Porsche to make our award-winning XM NavTraffic service available as a feature in the entire 2009 911 model range," said Steve Cook, executive vice president, automotive, XM Satellite Radio. "The Porsche brand is known for its exceptional performance, and we're proud to deliver our advanced audio entertainment and traffic technology to drivers who expect nothing less." "We are excited about offering XM Satellite Radio with the XM NavTraffic option to our 911 customers. This will be a great addition to our new for 2009 Porsche Communication System 3.0," said David Pryor, vice-president of marketing, Porsche Cars North America. XM NavTraffic feeds data on incidents, such as accidents and road construction, directly to a vehicle's GPS navigation system via XM's satellite and ground network. The driver is alerted to these incidents through the navigation screen, allowing him or her to route around a jam before getting caught in traffic. Where available, XM NavTraffic provides real-time traffic information by using red, yellow and green color codes to indicate high, medium and low congestion levels. All 2009 Porsche vehicles equipped with XM Radio and XM NavTraffic come with a three-month complimentary subscription.